It's my day to post for Die-Versions, and I have been SO eager to work with my newest dies! 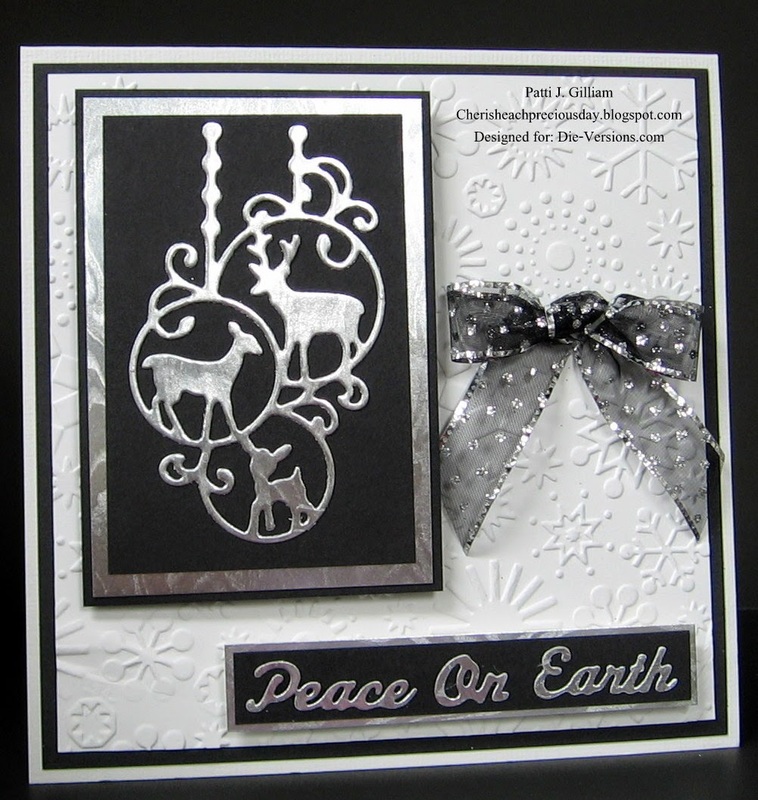 Dies used were "Peace on Earth" Sweet Wordlets DVSW-043, "Snowflake Corner" Whispers DVW-399, and "Deer Ornaments: Whispers DVW-388. All can be found in the Die-Versions store! completely and totally smitten with this one! 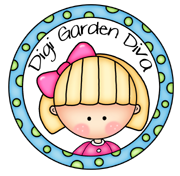 And while you are out and about, be sure to sign up to follow the Die-Versions blog! There is daily inspiration from the Die-Versions Dynamo's! 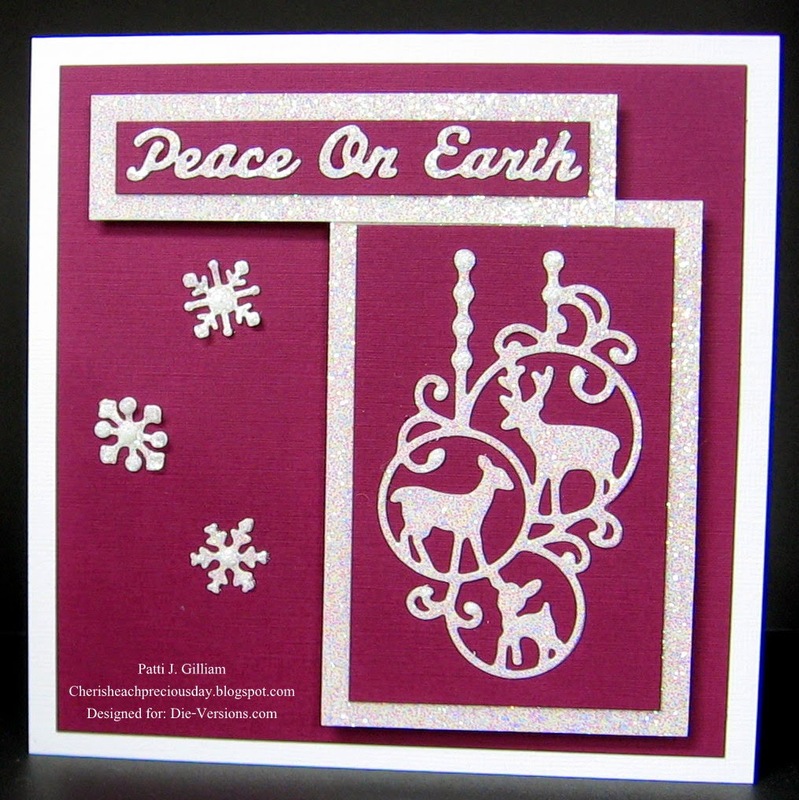 I'm entering one of my embossed cards in the Craft Hoarder's Anonymous Challenge #12. 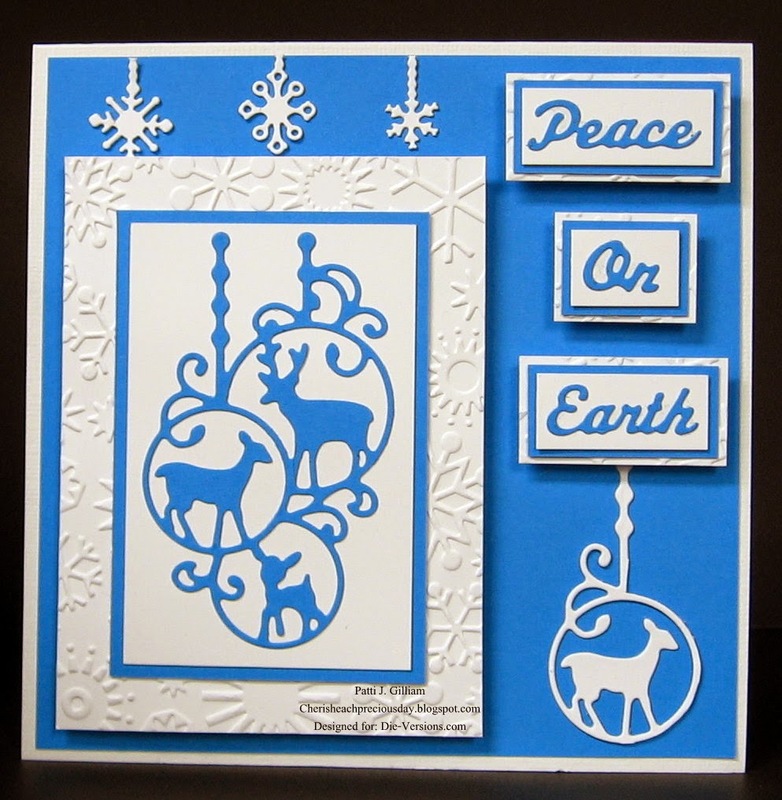 Also entering at Craftin Desert Diva's for their 'Christmas in July' challenge. Today, I am super excited to be hosting the Mod Squad Challenge. 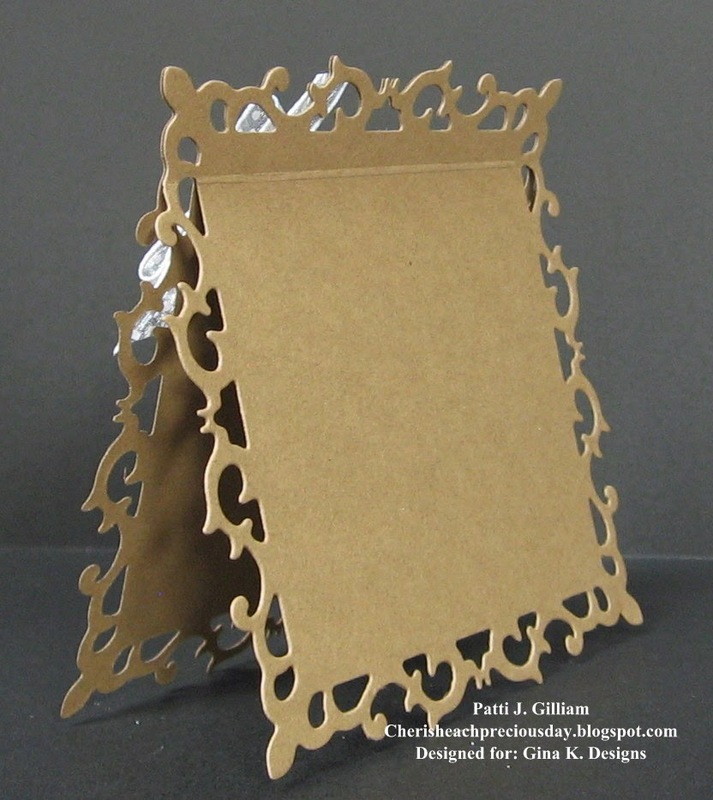 is to create something using the 'Shadow Stamping' technique. mailbox this week - a gift from Melanie. You should have seen my Post Office happy dance! Thank you Melanie - you are so kind and generous! If you have never shadow stamped, you will have fun with this. then stamp again, moving the image slightly, to create a shadow image. If you are a visual learner, Gina has a great video on StampTV, showing this technique. If you've ever been stumped on a monochromatic card challenge, this technique would be perfect! and play along with this challenge at the Mod Squad Challenge Blog! I know, I know....I was just complaining because someone 'stole' my week last week. 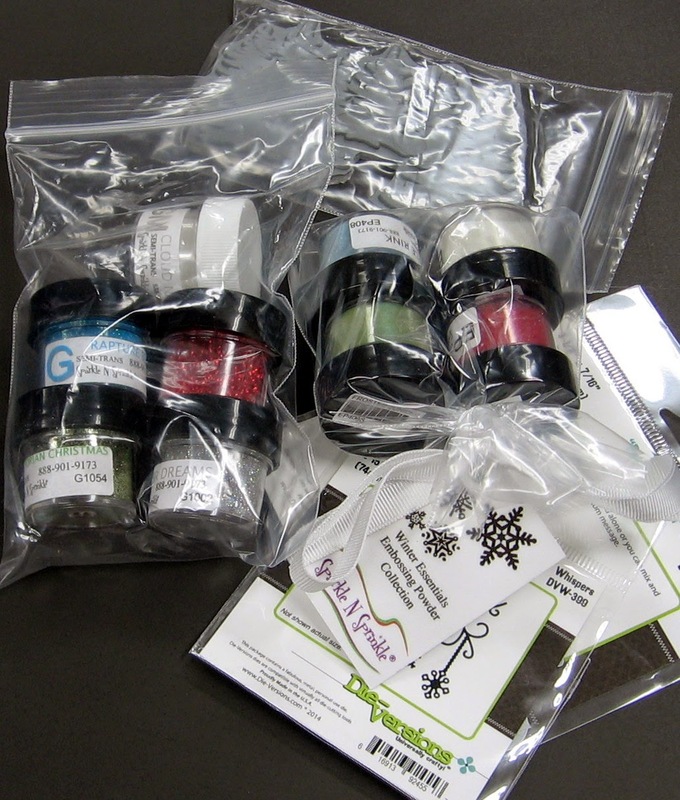 What could be more fun than Christmas stamps, Christmas dies, Embossing Powders, and GLITTER??? Hope to see you August 15th! Today's post is short and sweet, as I have some serious housework to do! Impression Obsession's challenge this week is: Nautical/Beach. 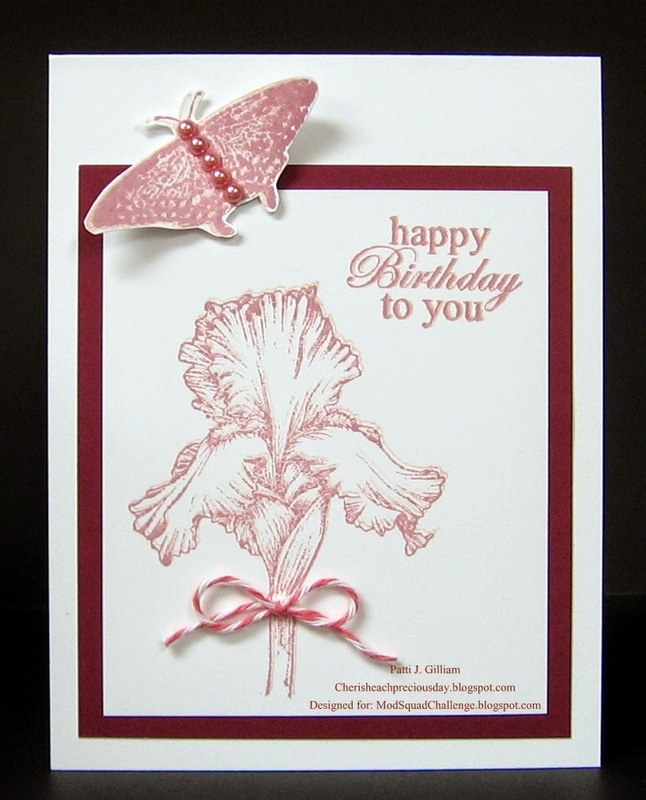 Thought I'd get this gorgeous stamp out, and create with it. 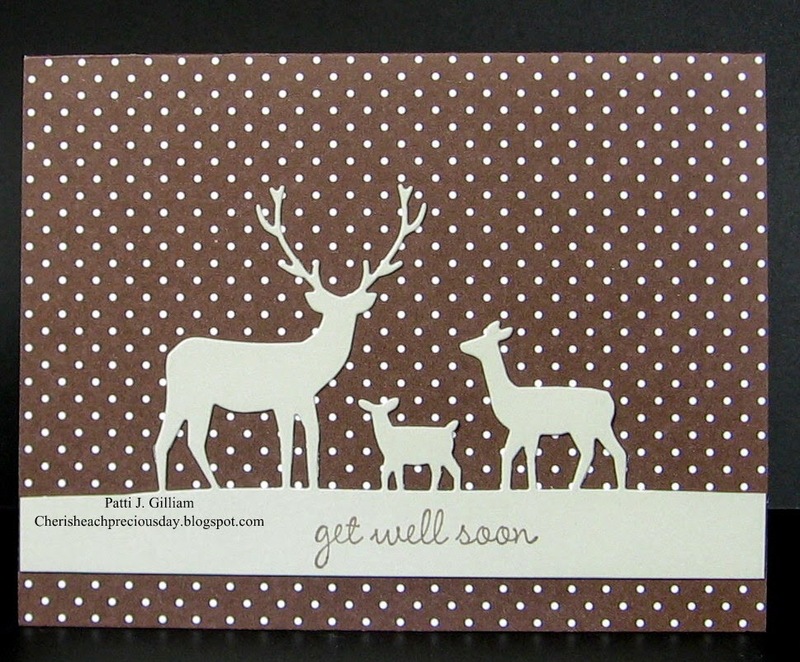 We had need of a sympathy card or three, and thought this would work well. 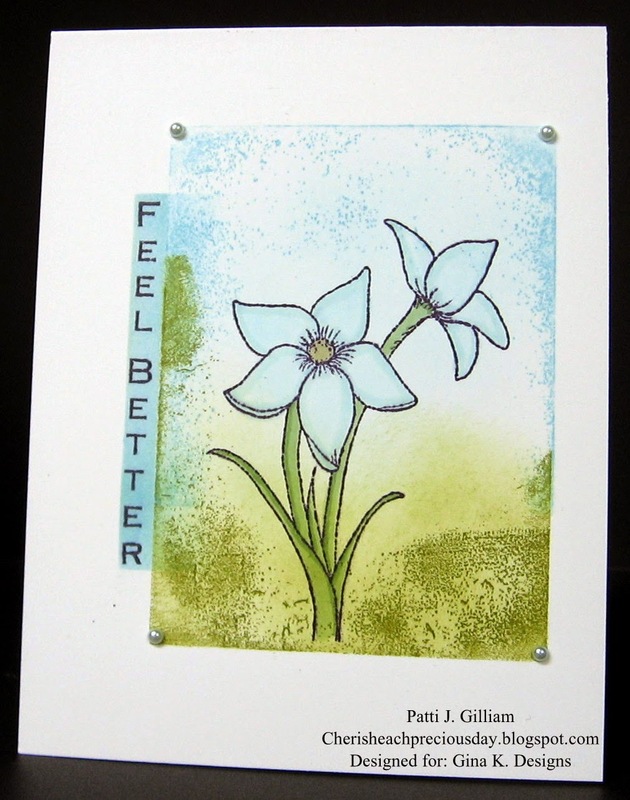 Impression Obsession 'Rowboat', Impression Obsession 'With Deepest Sympathy' All coloring is sponged on using different shades of Tim Holtz Distress Inks. I think this would be considered okay for the challenge - hope so, anyway! Time sure flies when one is retired! Hope you are all planning a fun and relaxing weekend with friends or loved ones. in September. We are going to have a 'date'. Love it when that happens! Thought I'd share a couple of things that haven't made it out here yet! Sometimes, we just need something very, very quick. That's what I am sharing today. 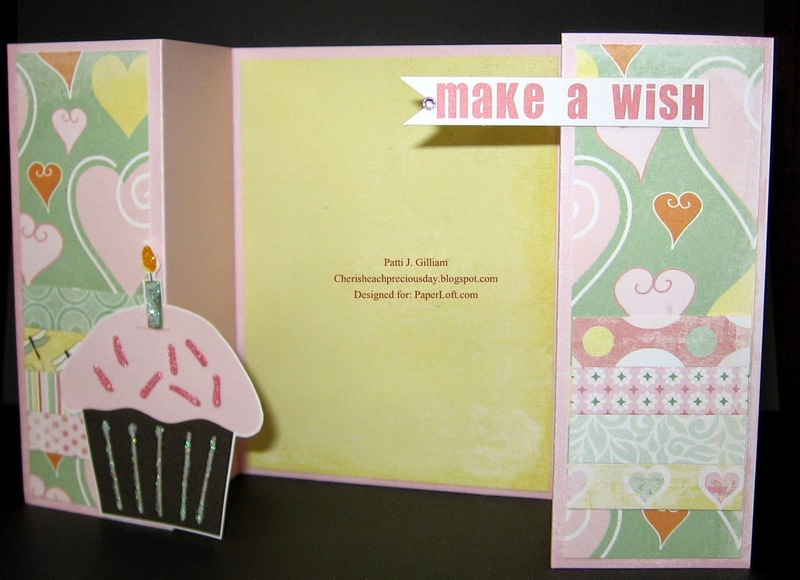 A bit of patterned paper, solid cardstock, and a couple of stamps - voila! I have a friend who was having some bad days - feeling 'invisible' or not important. needed something to cheer up my friend, Ginger posted this. Perfect! Just like my friend! 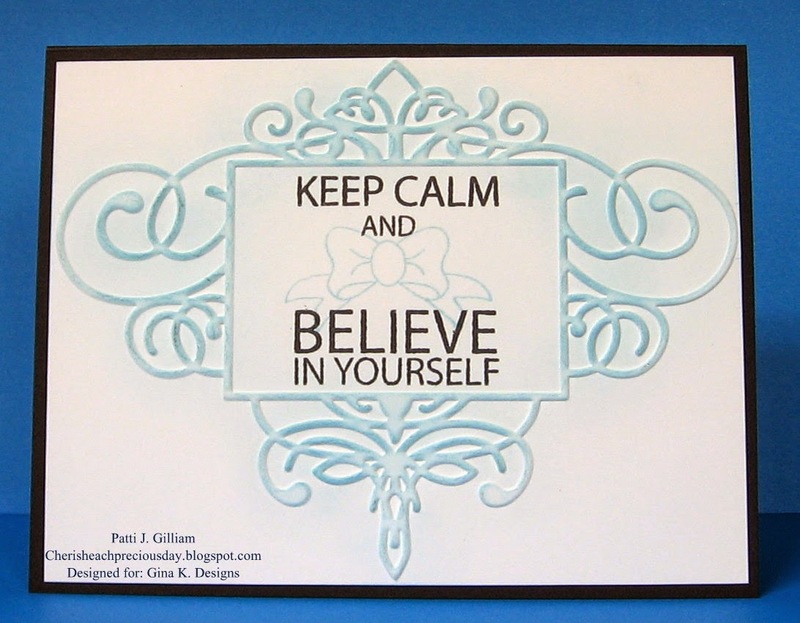 Used my Perfect Paper Crafting Mini Rulers for the beautiful matting on each of these! 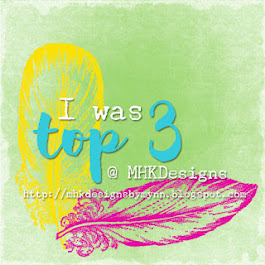 Check out my sidebar for details. This is also a sentiment from Ginger. Another friend had been in the hospital for over six weeks. 'enough is enough' - we miss you, or something silly - don't recall exactly. Whatever it was, it made her laugh - that's what mattered! this sentiment just had his name written all over it. Thanks for stopping by, have an awesome weekend! from the Die-Versions Christmas release!!! butterfly die. What a beautiful die to work with! I needed a very quick card, and immediately thought of this die. pieces of black bling, and voila! there's a brand new Christmas release in the works! Hope to share with you soon! inspiration that two teams will bring! Hope your weekend is off to a wonderful start. Recently, the Mister and I were invited to a pig roast. It's an every 3 year event, with a crowd of about 250 folks. I got to meet folks he's known all his life. The food was wonderful, and the dancing was fun too. 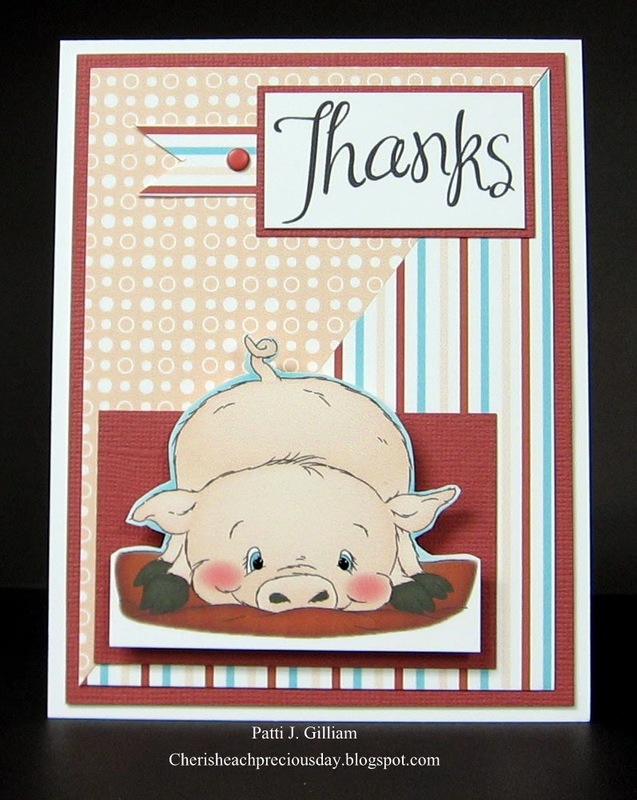 to my Doodle Pantry stash, and found this adorable, pre-colored Mud Piggy image and matching papers. generated, and went together in a jiffy! It's in the mail to them, and I hope they enjoy it! Wow, where has this week gone? Can't believe that it's Thursday already. so thought I'd share one today. You all know that I can, and do create with lots of fru-fru, at times. But...there are times when we all need a 5 minute card. This is one of those - seriously 5 minutes! 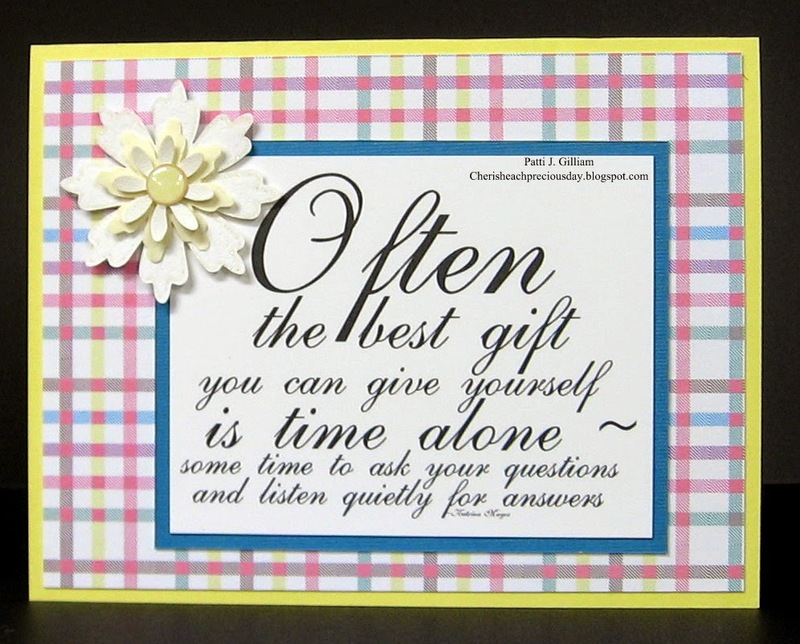 I had this pretty a|muse polka dot cardstock (which I love, as it's snow white on the back). 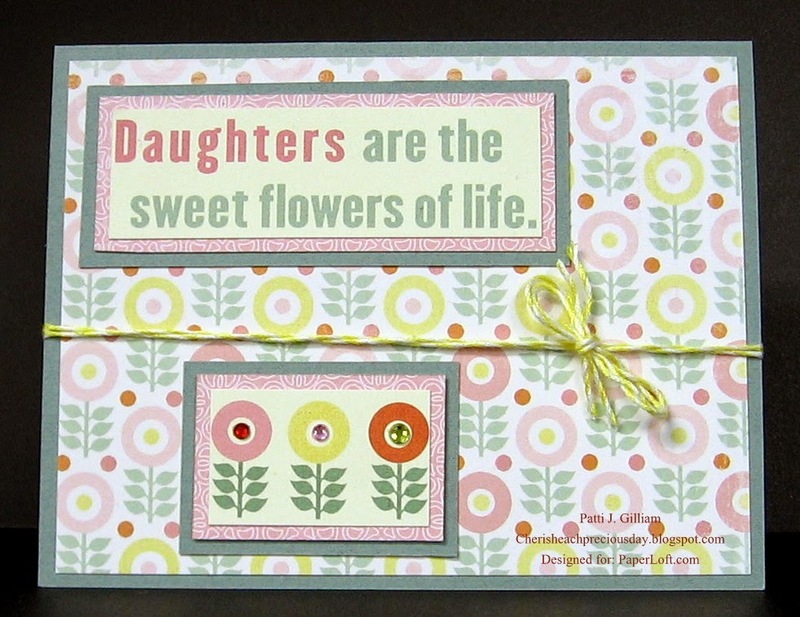 my Cuttlebug, adhered the die cut, and stamped a sentiment. It's my day to bring you some Die-Versions goodness! 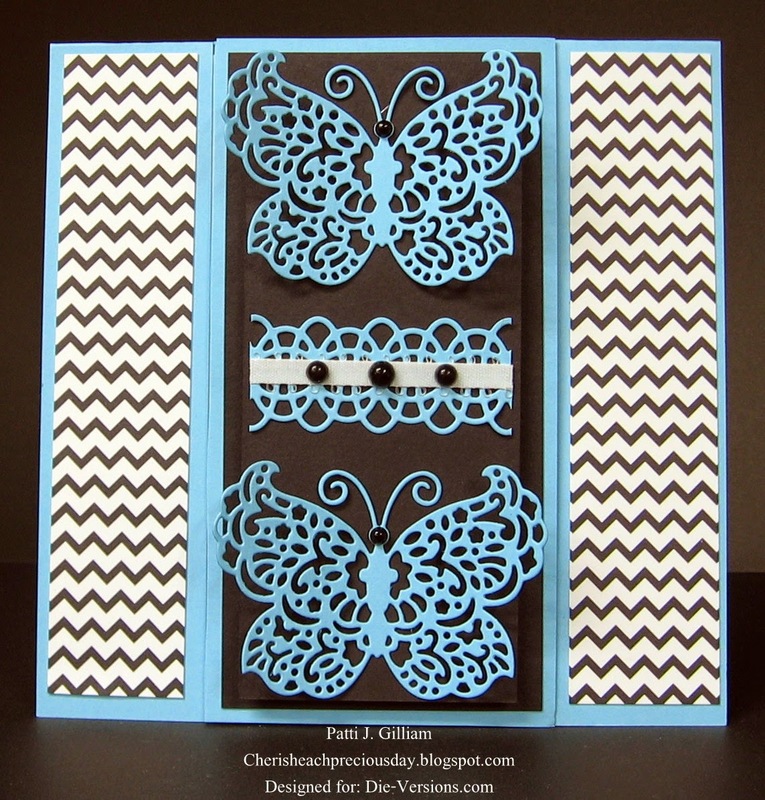 This card is made with the Die-Versions "Pretty Wings" Die. 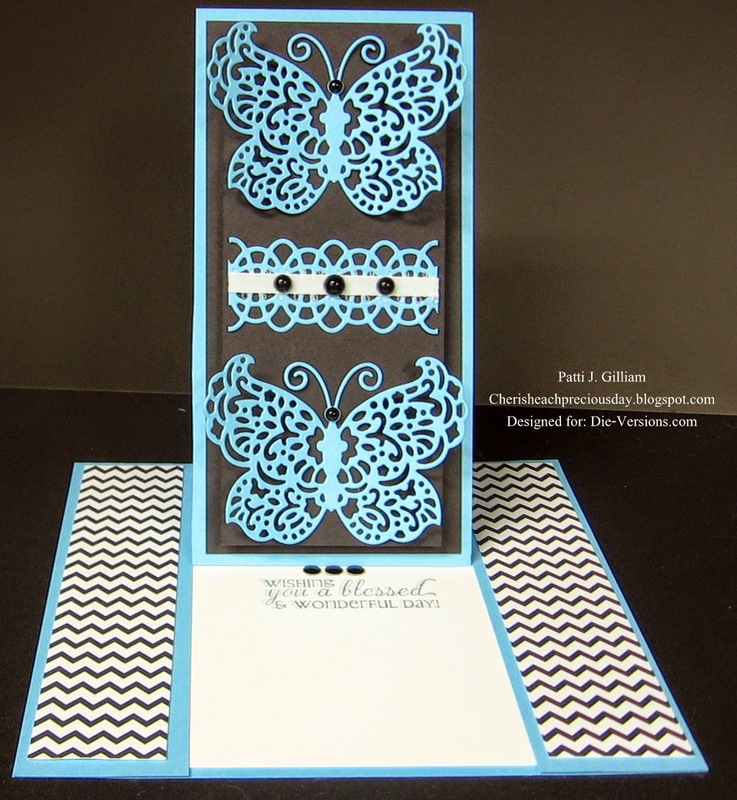 This is one of the prettiest butterfly dies that I've ever seen, and was so excited to see it in my last envelope from Die-Versions! as a fun little easel! 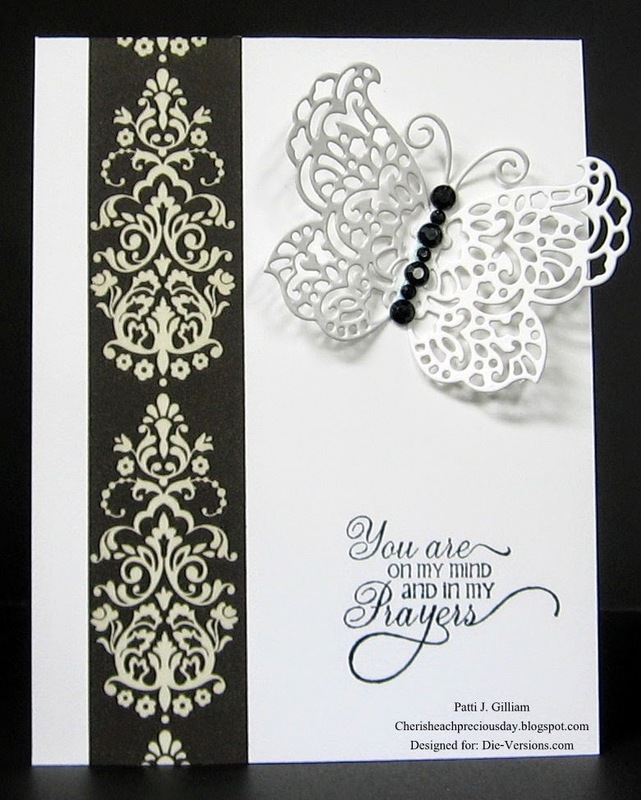 The small strip in the center is actually the "Crochet Lace" Die (DVW-322). seam with a ribbon scrap. 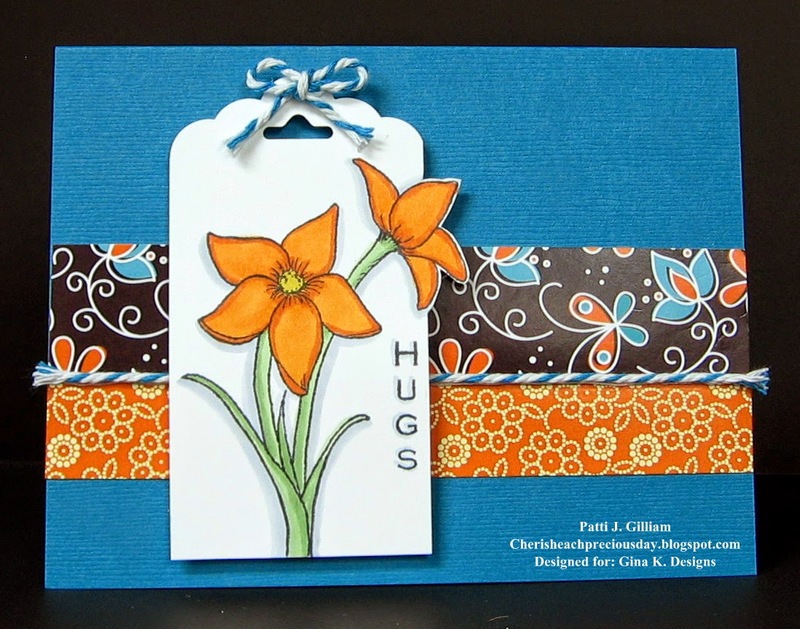 I totally LOVE this border die! Now, here's a view with the easel up. Isn't that just the most fun? 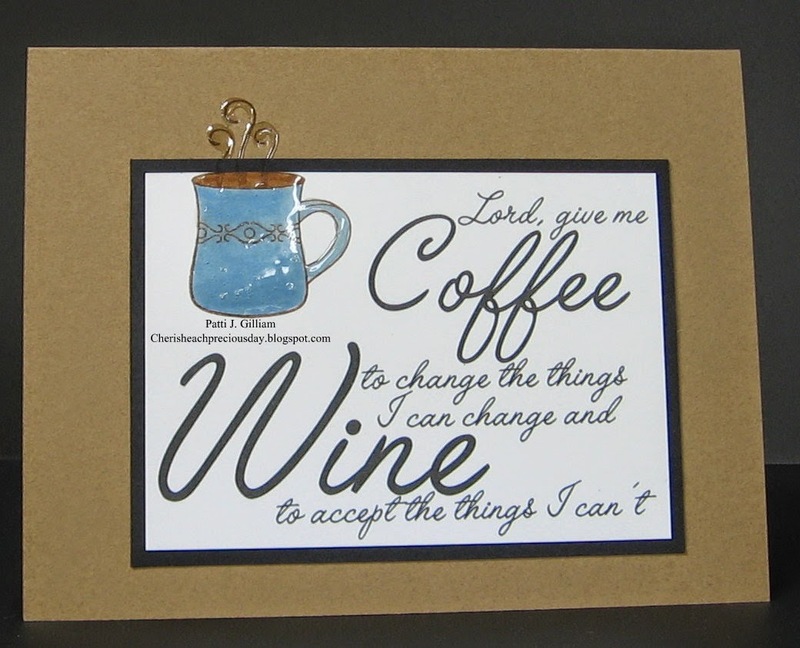 The sentiment inside says "Wishing you a blessed & wonderful day". tolerate heels like these! This die, "Shoe Collection", is so great - the set has every one of these shoes! punching a set of each color. The sentiment on this one is computer generated. This 'Diva' release was so much fun! I can't wait to create with these dies again! Hope you'll head over to the Die-Versions store and see what's new! 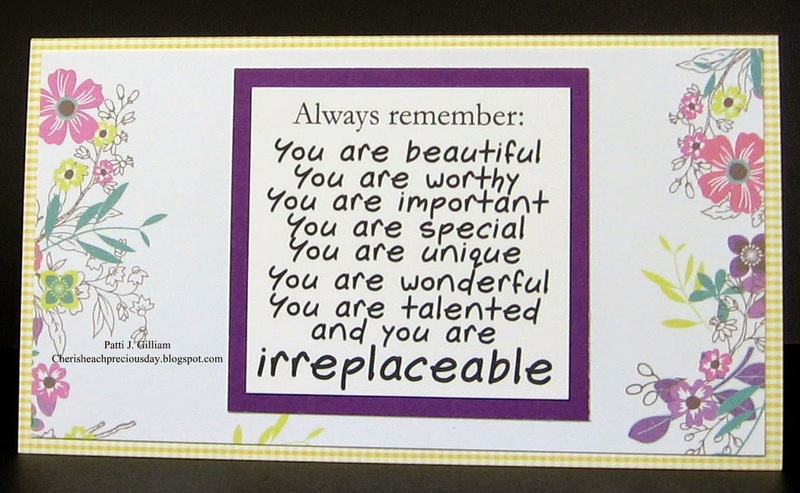 of daily inspiration to be found there, by the DV Dynamo's! 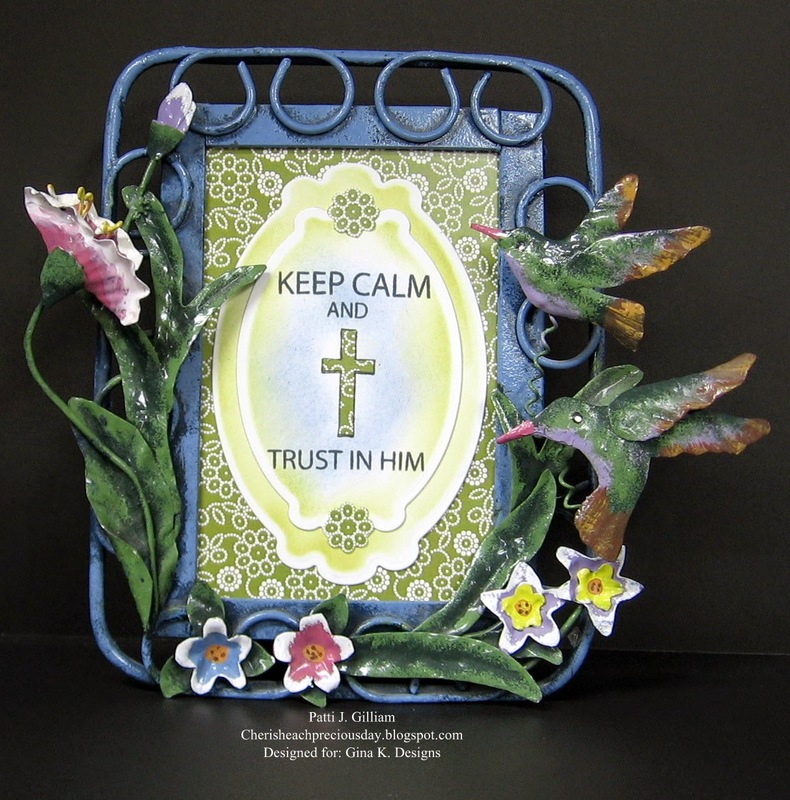 Our Daily Bread Designs "Flourished Verses"
Sure hope that your 4th was safe, and happy. 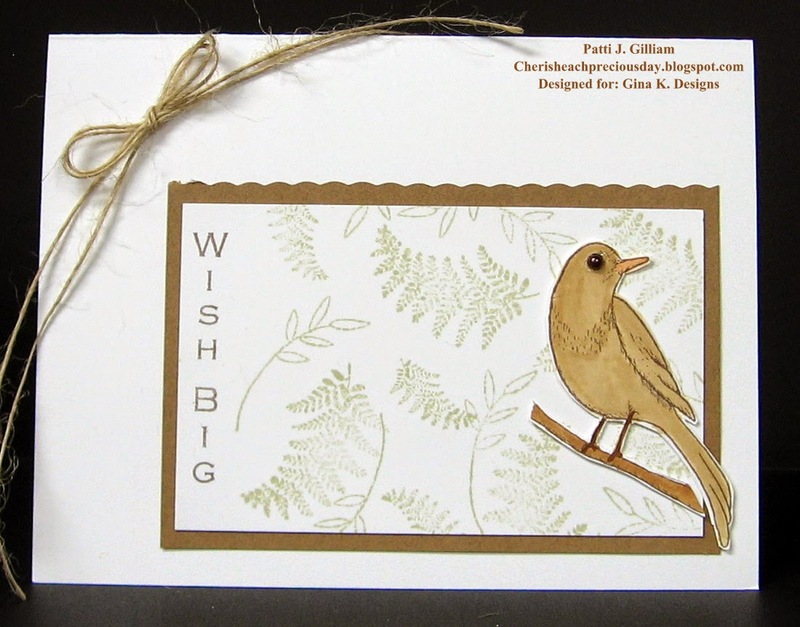 I was so lucky, to be chosen as a Guest Designer for The Paper Loft in June. For those of you who know me well, June very nearly did me in. I'm not sure I've ever had & survived a month quite like it! 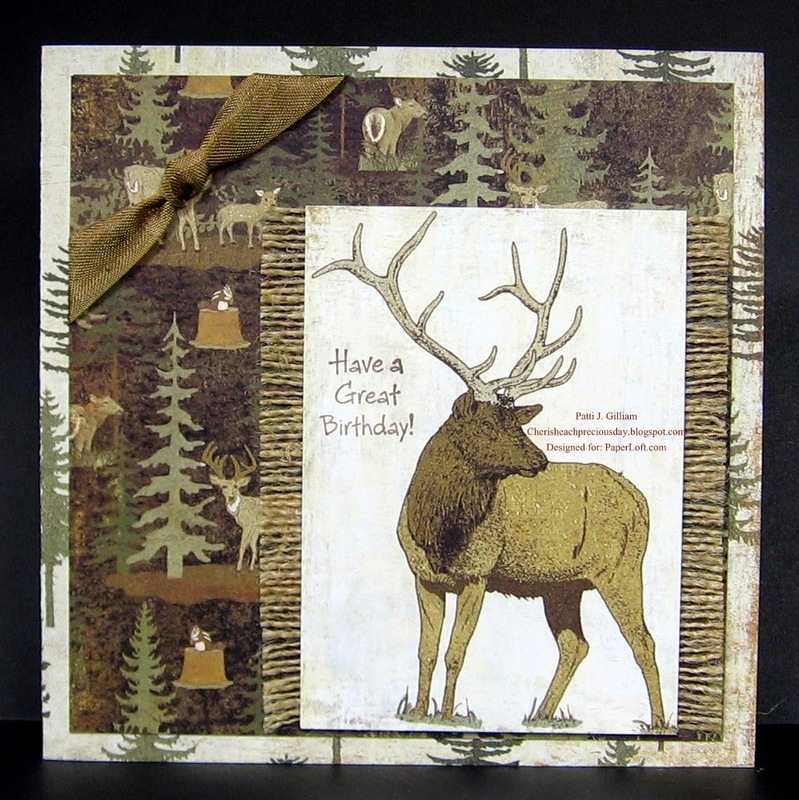 For that man in your life, this paper collection is wonderful! This is from 'The Great Outdoors' Collection. Another 5-10 minute card! Honest! 'On the Go' is this fun collection. LOVED these paper patterns! The sentiment is cut from the 'Happy' Accessory Sheet. The perfect mat is created with my Perfect Layers Mini Rulers! (See sidebar for details). 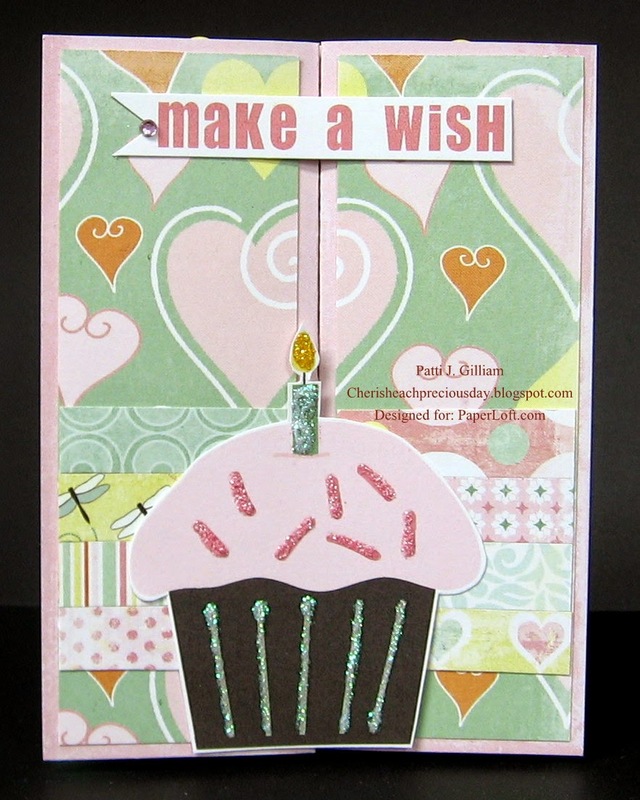 Last but not least...here's another fun card made with the 'Truly Scrumptious' Collection. The sentiment is from the 'Birthday' Accessory Sheet. To give you an idea, this sheet has EIGHTEEN words, pictures, etc., and the cost is ONE dollar! Where can you beat ONE dollar? This shows the card opened up. can truly have an awesome, 5-10 minute card! I will certainly be ordering from them in the future! 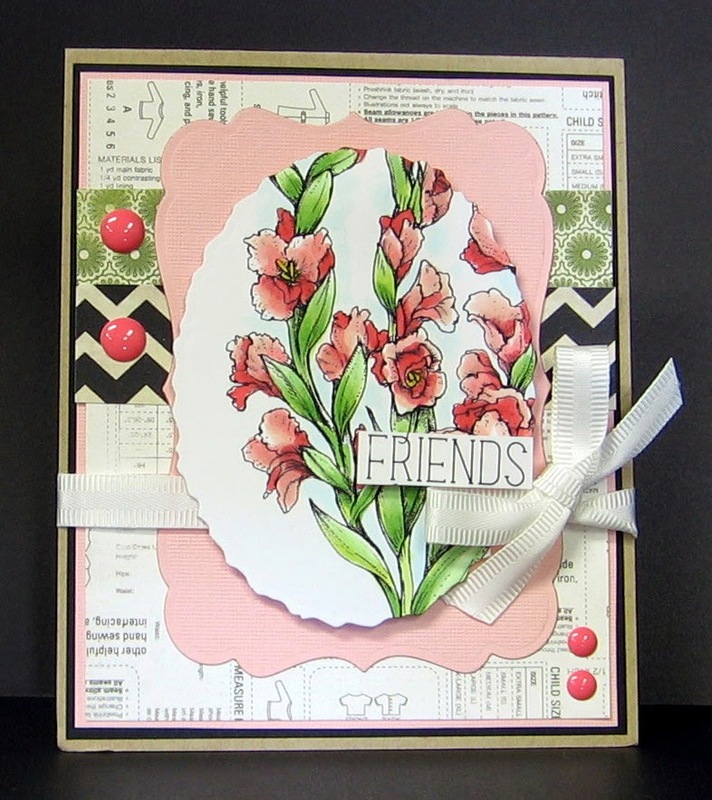 You can follow The Paper Loft Blog HERE!!! Be sure to take part in their challenges! 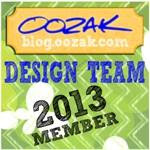 YOU could be their next Guest Designer!!! I'll be back on Monday with a fun creation for Die-Versions' newest release! Just want to wish you all a very happy Independence Day! 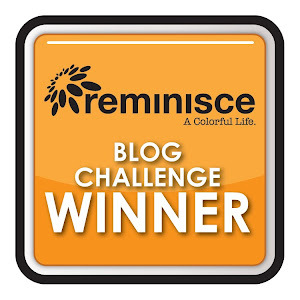 I wanted to share with you some Blog Candy that I was lucky enough to win, a couple of weeks ago, on Dawn Burnworth's blog! If you have never been there, you should go! This lady is UBER talented, and so sweet! 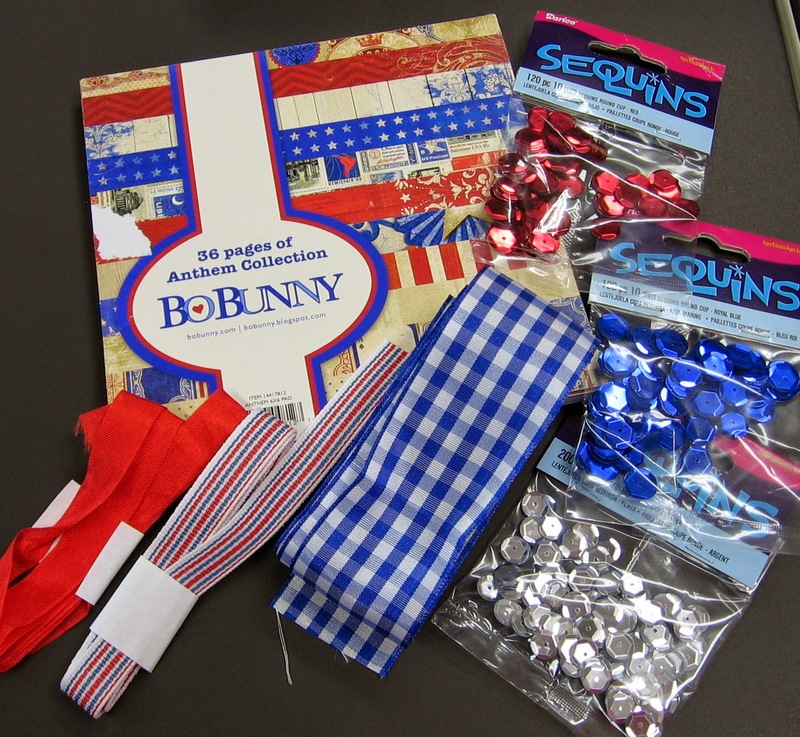 What fun, and just in time for the holiday creating that I needed to tackle! 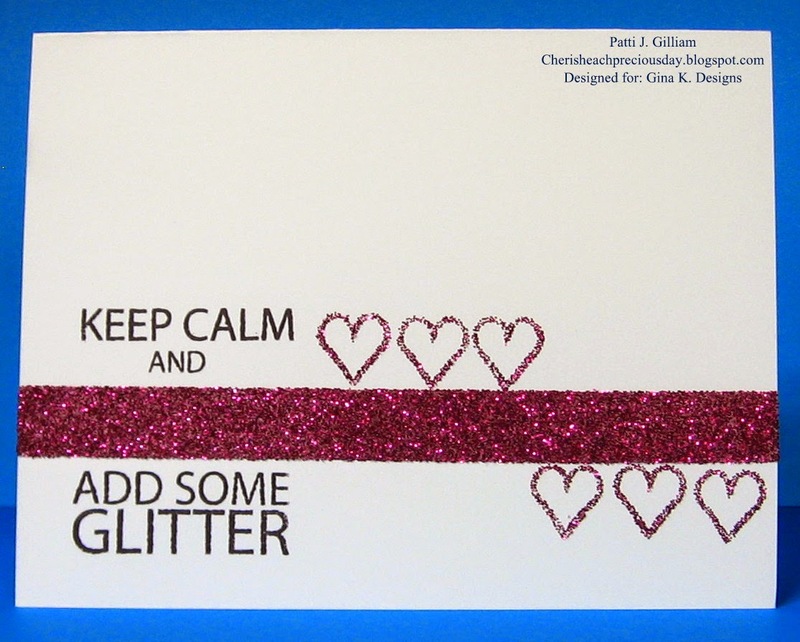 Last, but not least, here is what I created with the fun papers and sequins! Image is a Freebie!!! 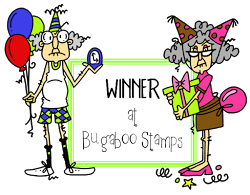 from Whimsie Doodles Stamps. It's colored with Copic Markers. 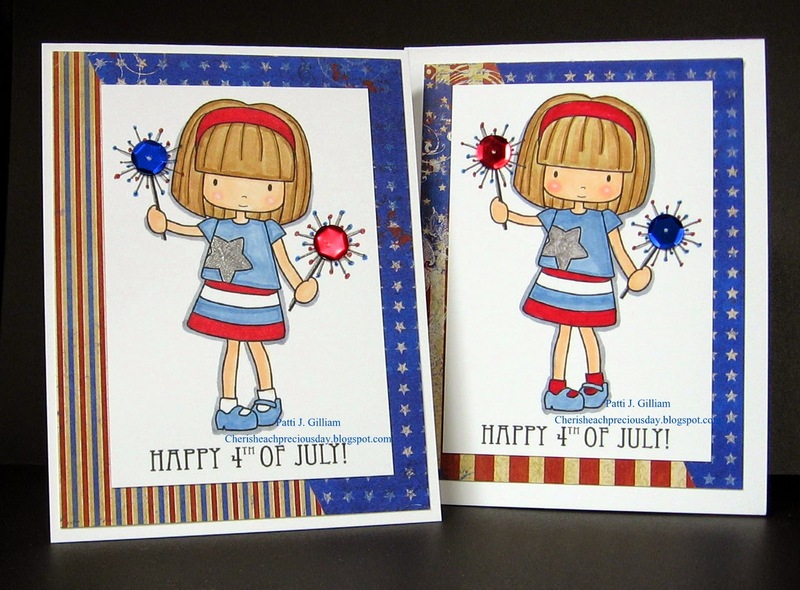 The sparkly star, and fireworks are colored with my red and blue Spica Glitter Pens. Dawn, if you are reading, thank you so much! 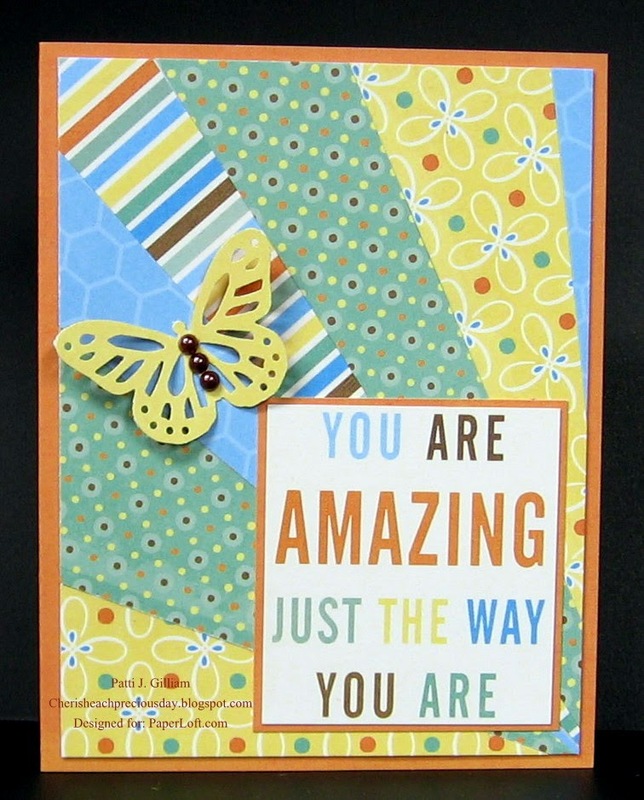 A chemo buddy and a senior buddy will be the recipients of these special cards! Have a safe, and fun holiday - hope you are spending it with family and friends! 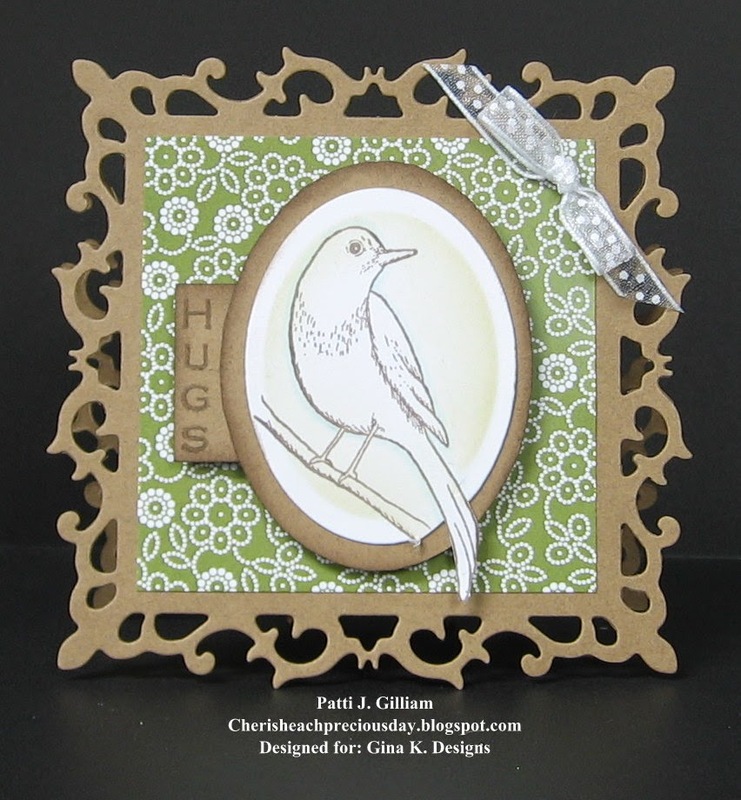 Gina K. Designs - New Release Hop, Day Two! Here I am for day two - STILL excited!!! Thank you, Gina, and Crew! you with many beautiful ideas! 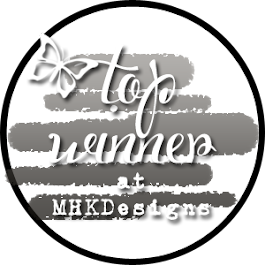 will each win a grab bag of Gina K. Designs products! a few days after the hops. Here are my projects for today's hop! 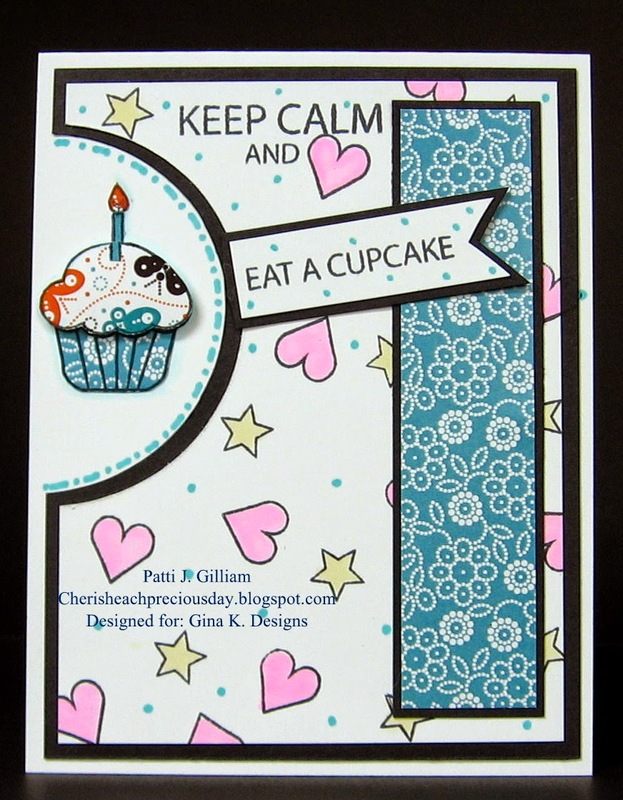 For my first set, I am featuring projects made using Beth Silaika's 'Keep Calm' set. This is such a nice set, and good for so many occasions. 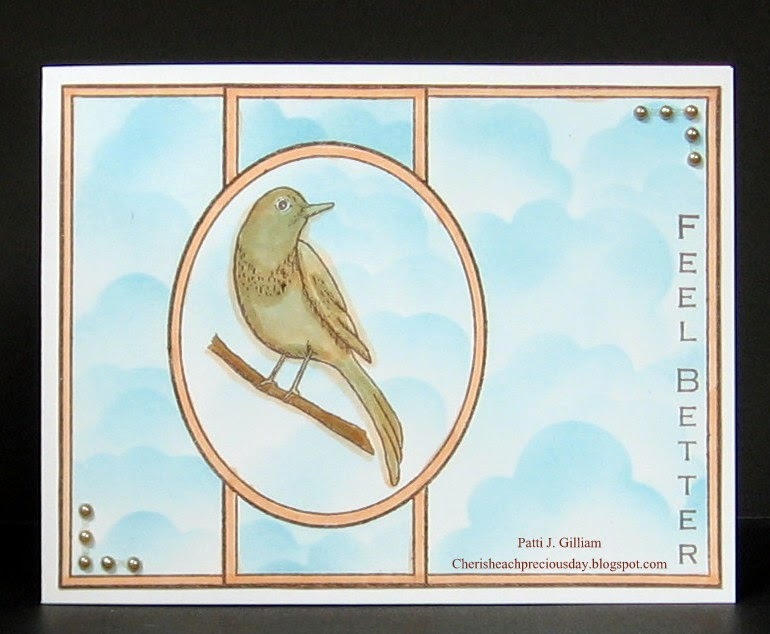 And last, but certainly not least - one of my favorite designers, Theresa Momber, has come up with a new set called Vertical Greetings 2, that I loved working with. In case you missed the hop on Monday, here is the Link List for Day One!